According to the Department of mechanical and energy engineering discipline development planning, the following three major innovative practice platforms are establishing. Meet the practical needs of undergraduate course teaching (Cognitive practice in machine manufacturing for freshmen or higher grade students and Foundation of advanced manufacturing engineering for Junior or high grade students)，then the need of students' innovation practice teaching(Practice, graduation design, extracurricular activities and scientific research participation, etc. ), last the need of students' autonomous practice (Students' innovative ideas need to have a practical base to support). 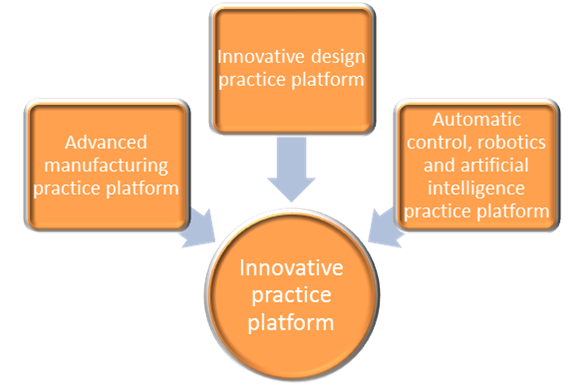 Advanced manufacturing practice platform also supports and serves the needs of practice in the teaching of graduate courses, research in the design and manufacturing and testing needs, as well as research and manufacturing needs of the relevant research projects. Meet the practical needs of design course（Engineering drawing for freshmen or high grade students，Mechanical design basis for junior and high grade students as well as related professional courses and graduate courses, etc.）, students' science and technology activities independent innovation practice requirements, etc. It is should be specially pointed out that innovative design platform support original innovative ideas, principle test and prototype development activities, and also support design manufacturing integration. We encourage students to break the boundaries between disciplines, and strive to achieve the integration of different research fields of non-traditional. Meet the needs of relevant practice courses（Foundation of control engineering for sophomore or higher grade students, robotics for junior or higher grade students, artificial intelligence under the plan）. Meanwhile, this platform can support students autonomous innovation practice and related research topics.